I have a 1997 motorhome which has recently developed a leak in a sliding window. I have sprayed water on it from the outside to try to determine where it was leaking and it looks as if the water is coming from under the window trim. The water then flows over the wall onto the seat cushions. All of the weep holes are open and appear to be working fine so I think that the butyl has dried up and is now leaking. My question is how hard is this to fix? It would seem all I need do is remove the trim from the inside and then push out the window. I'm not familiar with all of the elements of the window, like where the butyl tape is located and what is that material around the window; is it to seal or just for aesthetics? Any guidance would be very much appreciated. 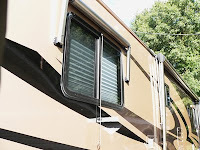 First, remove the garnish trim ring inside the RV and then carefully push a wide blade putty knife under the exterior flange to break the seal of the existing sealant. Have another person hold onto the window even though it’s unlikely it will simply fall out. After you cut through all the sealant around the entire perimeter, slowly push the window out from the interior while the helper keeps cutting through the sealant with the putty knife. Be sure the window stays flat while pushing it out. Don’t allow it to flex too much as this may crack the glass. Once the window is free from the sidewall, lay it on a flat surface and remove all remnants of the existing sealant. This is important; all the old sealant must be removed from the flange and the sidewall. Once cleaned, install new sealant to the inside of the exterior flange (Eternabond tape works great in this instance). Apply a vinyl-backed thermal barrier to the inside of the interior garnish trim. Then center the window into position. It may be necessary to shim the window in the cutout in the sidewall. You’ll want an even gap all around. I usually use a tapered shim (no longer than ¾ the thickness of the wall) to easily “lift” the window to the correct placement. Again, your helper is holding the window in place during this installation. Once centered in the opening, install the inside trim ring. Be sure to reinstall all the screws. If any screw appears stripped or will not tighten properly, replace it with a larger screw. This is what actually “sandwiches” the wall between the inside and outside flanges. The exterior sealant should fully compress all around the perimeter. If any gaps are evident it will be necessary to remove the window and apply extra sealant in those areas. Remember, not all sidewalls are completely flat. Some aluminum patterns have many dips and valleys. Likewise the vinyl-backed foam tape on the inside trim should also fully compress thereby effectuating a tight vapor seal. Carefully use a utility knife to trim the excess sealant that has squeezed out from the flange. Some shops may apply a thin bead of clear silicone sealant on top of the window frame, but if the installation is performed correctly, this is usually not necessary.